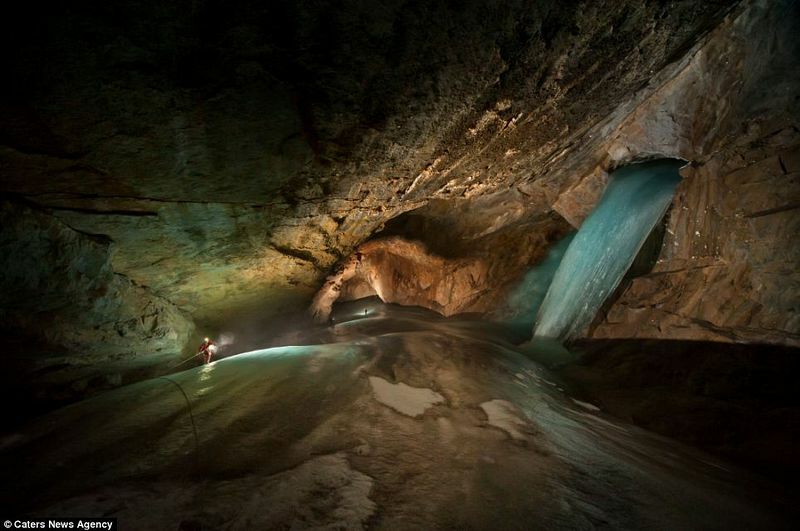 Booming Ice Chasm is a stunning ice cave in the Crowsnest Pass area of the Canadian Rockies in Alberta. The cave is so called for it's incredible acoustics. 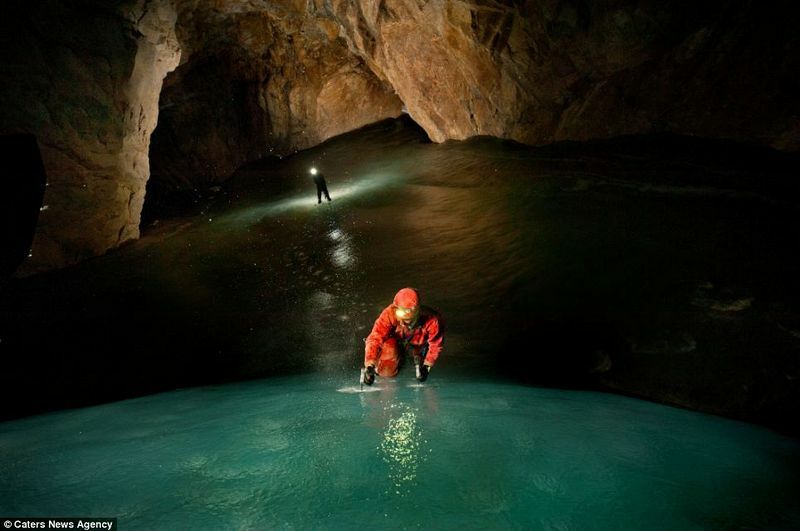 It is said that as rocks tumble down and crash to the cave floor, 140 meters below, it causes booming echoes. The cave is located about 700 meters up the side of a mountain with its entrance tucked behind a rocky ledge and nearly impossible to see. No wonder it remained undiscovered until 2005 when spelunker Chas Yonge first spotted the chasm as a mysterious dark spot on Google Earth. 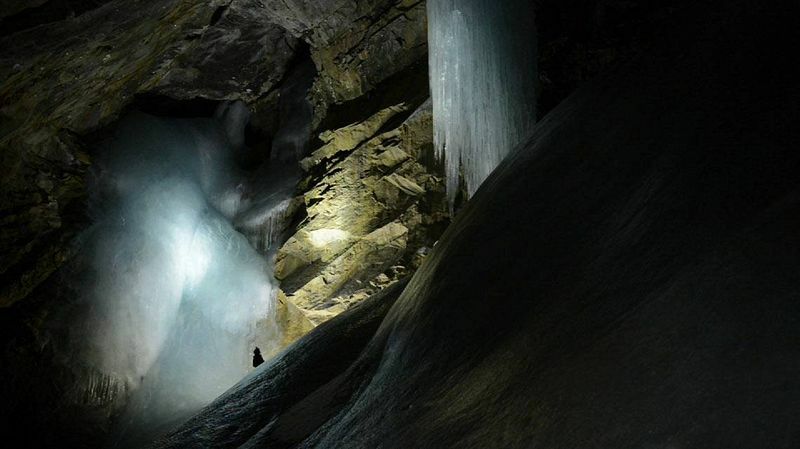 Booming Ice Chasm is what’s known as a “cold-trap” cave, where cold air enters the cave and sinks to the bottom displacing any warmer air which rises and exits the cave. 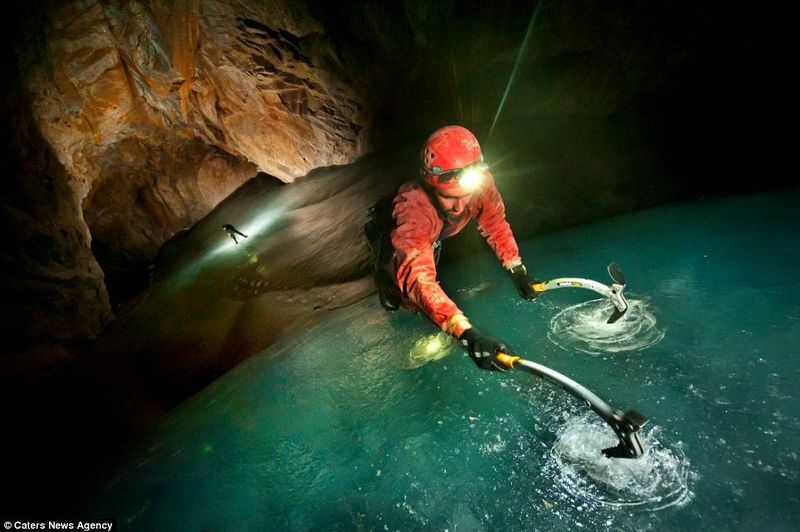 The cold dense air is never able to escape keeping the cave frozen all year round. The entrance to Booming Ice Chasm is a gaping hole in the side of the mountain, several meters across. 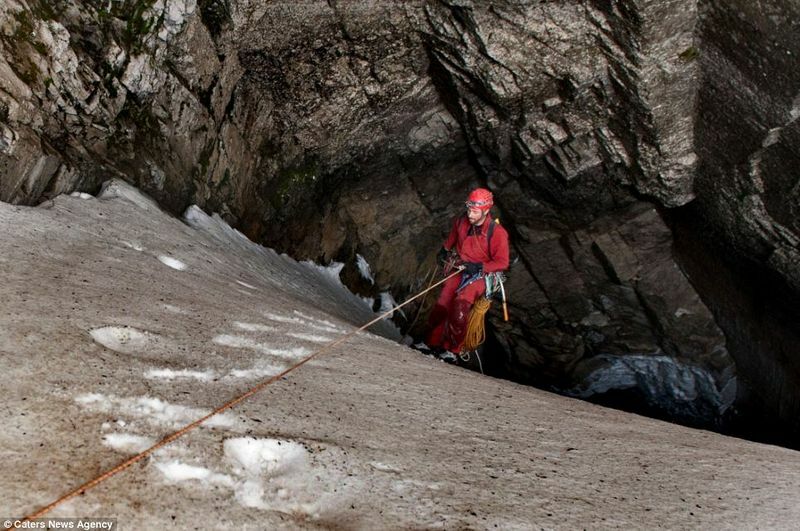 It slopes downward, lined with loose stones and snow that gives way to a sheer ice slope, dropping some 200 meters. This natural icy slide is extremely treacherous as anything dropped here shoots down the steep slope to the bottom of the cave at fatal speeds. Because of the booming echoes, conversing inside the cave is difficult as each word sets off a series of echoes that makes sentences unintelligible. 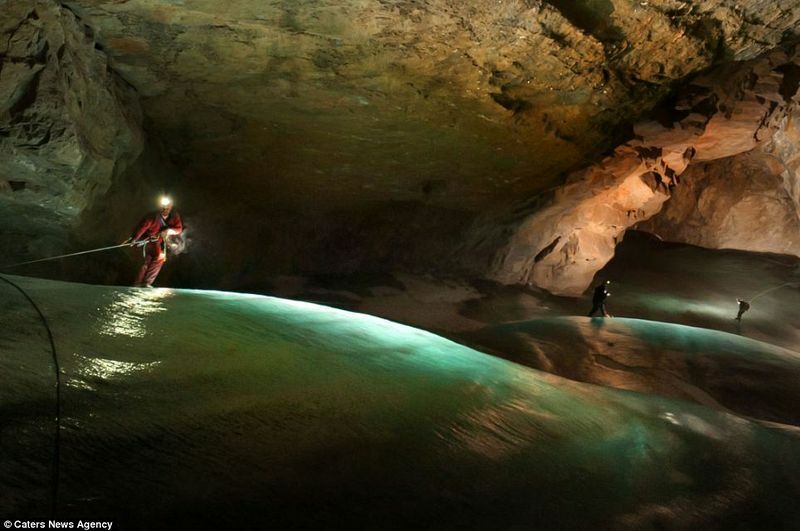 So cave explorers have to speak in hushed whispers into their radios or speak in syllables, by halting several seconds between each to allow the echoes to die down. 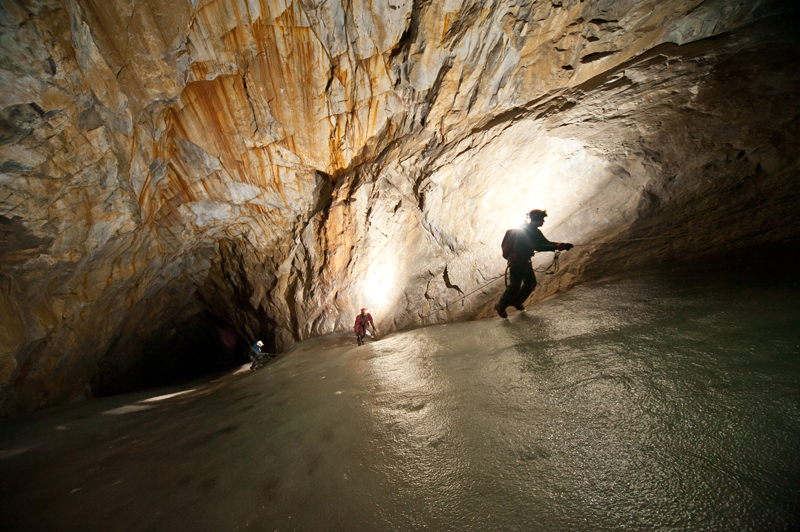 The cave was first explored in 2008, but there are several passages that are yet to be explored and mapped.